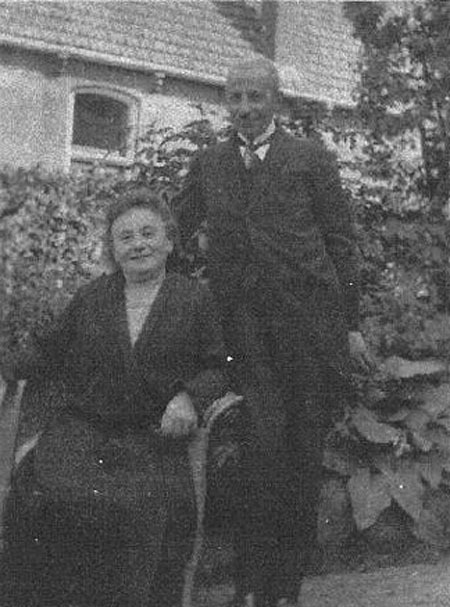 In 1893 Saartje Kan (born in Meppel on 7 June 1883) married Salomon van Zuiden (born in Meppel on 14 November 1863) in Meppel. Salomon (also known as Salli) was one of the sons of Meijer Salomon van Zuiden and Sara Kan. Meijer and Sara had five more sons: three sons died soon after birth; Abraham and Eliazer remained alive. Abraham married Sara van Huiden. They had two daughters, Marie and Regina, who were both killed in Auschwitz in 1943. Eliazer married Elisabeth Jacobs. They had one daughter, called Serli, who just like her nieces, was gassed in Auschwitz in 1943. Saartje and Salomon had three children: Selma Elisabeth Adèle (1894), Menno (1904) and Emil (1897). Saartje van Zuiden-Kan and her husband Salomon van Zuiden. 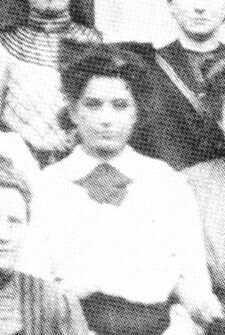 Selma van Zuiden at the French School in 1909. (at that time Menno’s girlfriend), Selma en Bernard Hes-van Zuiden. The three children received their education at the Rijks HBS (State grammar school) for a few years. Selma first started her education at the ‘Fransche School’ and continued and finished her study in the third form of Rijks HBS. Emile was only one year and Menno two years at that school. In 1894 Salomon, Abraham and Eliazer van Zuiden bought the premises of textile trader Abraham Israel van Esso, a practical place, because the front of the building was situated on the 2nd Hoofdstraat and the back of the building on Groenmarkt. The address was then 8 2nd Hooftstraat. Here they started a ladies fashion store. Eli died in 1909; Salli and Abraham carried on the business. In 1915 the description of the business in the telephone book was as follows: ‘77 Zuiden, Gebr. v.. Manufacturen, Gordijnen en Tapijten, 2e Hoofdstraat 8.’(tel. 77 Van Zuiden brothers, drapery, curtains and carpets). In 1916 the home and the shop came into the hands of Abraham van Zuiden. When he died in 1927, they passed to his widow, Sara van Zuiden and her children. Sara let the shop to Salli, who together with his son Emil ran the fashion shop. After Salli had died in 1929, Emil took over the ladies fashion shop. In the thirties Emil moved the textile shop to the opposite side of the Hoofdstraat, the grand tall building, now C&A. They sold the old premises to Salomon Kats, who started a luxury ladies fashion shop. 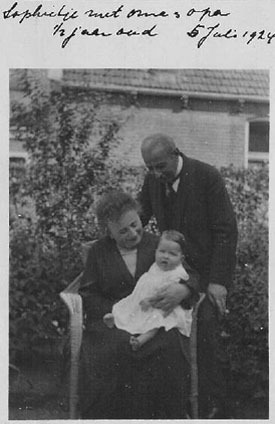 Until 1941, Emil was assisted by his Jewish shop assistant Biene Veldman, who lived in a boarding house on Molenstraat. That year she left Meppel; she survived the war. 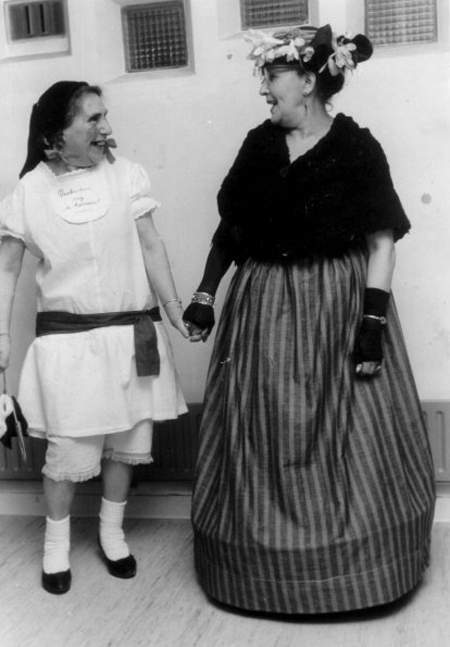 Roos Wolf (left) and Biene Veldman (here seen at a festive occasion) spent their last years together in the Jewish home for the elderly. The Van Zuiden family lived at 23 Stationsweg. Since Emil never got married, he still lived with his mother, years after his brother and sister had left their parental home. Then mother and son went to live in a smaller house and rented the house at 17 Stationsweg. The old house remained in their possession and was let. During the first years of the war, the experiences of mother and son Van Zuiden cannot have been different from those of other Jewish business people. Regarding the shop: business closed, merchandise taken out of the premises, business liquidated. As for their private life: isolation, handing in all valuable things and intimidation. 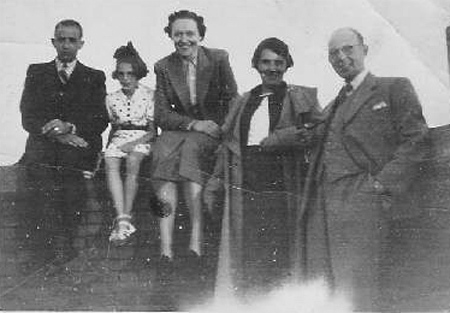 Since the beginning of the 20th century the Van Zuiden family had been able to afford to go on holidays abroad. They always sent postcards to the children or brought back postcards as souvenirs. Emil glued all the cards in photo albums and always kept them in good condition. He must have been attached to them, for when the situation got worse, he or someone else, of course with his knowledge, hid the albums in the warehouse of greengrocer Van Echten in Kromme Elleboog. There they survived their owner. In the sixties, during a small renovation, a layer of triplex was removed from the ceiling. Suddenly, two albums with travel memories fell down. On 20 July 1942 followed the next disillusionment. Emil had to take the bus to the labour camp in Orvelte. He was ill, however. Ill is not the right word really, because he had tried to commit suicide. No problem, he got some time to recover and with the second transport on the 31st of July he was taken to camp Vledder. Emil and the other people from Meppel all had suitcases holding clothes and toilet things with them. A few days before, they had all got orders to report to the camp, which was under Dutch command. They had to do reclamation work on the heath. The earth of the higher parts had to be taken in tip carts to the lower parts. These carts ran on rails, sometimes over a distance of 100 meters. These people did not know a thing about this type of work, as most Jews earned their living in trade. They were treated very badly. They had to work hard and hardly got any food. They sometimes stood in queues at the neighbouring farms to beg for food. In those days, potatoes were cooked in a cooking pot as food for the pigs. It sometimes happened that the pigs never got a turn to eat, because the men, mostly young, had eaten it all. I was a schoolboy then, but I remember we had special addresses where we could pick up food for the Jews in the camp. In the dark of the night, wheelbarrows were put in the middle of the field at an agreed location, so they could consume the food we had collected the next morning. These wheelbarrows were made of wood. We called them ‘Polder kruiwagens’ (polder wheelbarrows).When the Germans caught them eating, there was trouble. As a punishment they had to work in separation. I can still remember the tough clumps of grass that were awfully difficult to cut through with a spade, especially if one is not used to working with it. Obviously, the Germans selected such a piece of land as a punishment. 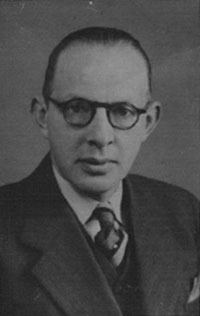 Maybe the men went to Westerbork with a little hope on the 3rd of October: ‘It couldn’t be worse and …they would finally see the family back.’ Probably, Emil had that same thought! He was also worried how his 80-year-oldmother was. Saartje had stayed behind alone in the house on Stationsweg, but even there the old lady was not safe. 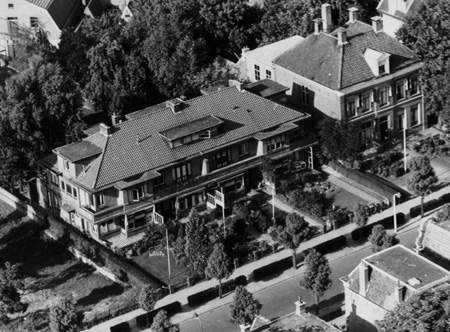 On the 27th of September she received a letter from the Mayor of Meppel: if she would vacate the house before 1 October, as the building had been claimed by the Wehrmacht (German army). At her age she had to find new accommodation. Luckily for her, she could stay with the Goldsteen family, 32a 2nd Hoofdstraat. From there she must have been taken away, on or just after the 3rd of October. Beforehand, the contents of Saartje’s home had been listed. It was precisely stated, what could or could not stay in the house. In Westerbork, Saartje met her son again, but they were not together for long. Already on the 26th of October Saartje was put on the train to take her to Auschwitz. Three days later the unavoidable happened. 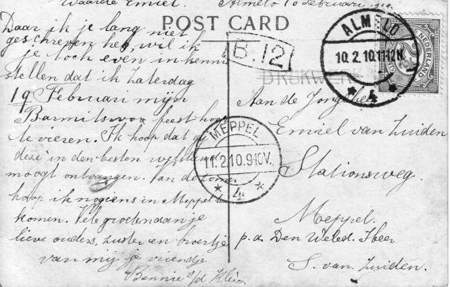 Postcard from the album of Emil van Zuiden, recovered a long time after the war. When Emil left Westerbork we do not know. The only thing that we know is that on the 31st of March 1944 he died somewhere in central Europe. Selma, her two daughters Sonja and Sophie and Menno survived the War, her husband Bernard Hes was killed. 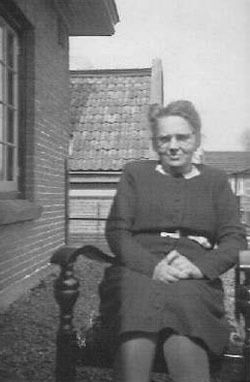 Selma van Zuiden after the Second World War. Probably, around 1941 the family van Zuiden had to close their business and both merchandise and inventory came into German hands. 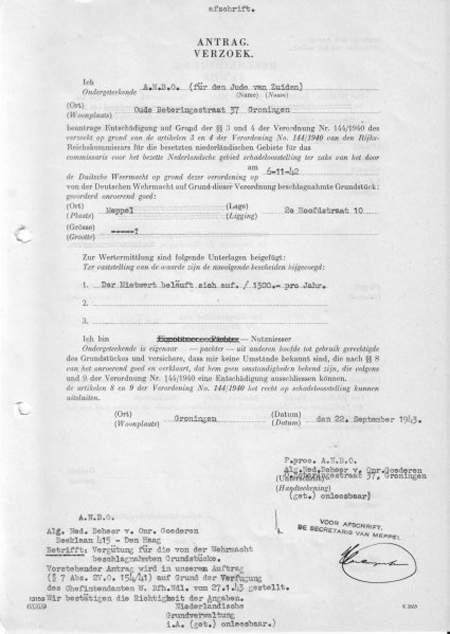 ANBO (real estate brokers appointed by the Germans). The building in which the Van Zuiden shop was situated, at present C&A, was closed. Although the building was completely locked up, we boys, all around 10 years old and living in the neighbourhood, managed to break in and play in the attic of this desirable building. For boys of our age it was very exciting. Like with all other Jewish businesses, Omnia was called in to liquidate the firm, Fa. Gebr van Zuiden, including the house, as it was part of the company. Dr Emil Seuser was in charge of this for Omnia. According to regulation 154/1941 the shop on the Hoofdstraat came into the hands of the Niederländische Grundstücksverwaltung (Dutch land and property administration), who then handed over the management to the firm of J. J. Voorzaal and van Staveren, 7 Janskerkhof in Utrecht. After the war the old situation was re-established; the house and shop were returned to the descendants of Emil and his mother. The premises, in which Emil had run his fashion shop for many years, came into the hands of the Hes ladies, who sold it to the Wortelboer family.